The 11th annual Deepdale Christmas Market takes place on Friday 29th, Saturday 30th November and Sunday 1st December in the lovely village of Burnham Deepdale. Visitors to the market can enjoy ‘Not on the high street’ presents, decorations, food and drink in three large marquees around the Dalegate Market site, in the barn of Deepdale Backpackers & Camping, and amongst the pews in St Mary's Church. Deepdale Christmas Market is open from 10am to 5pm on all three days - Friday 29th, Saturday 30th November and Sunday 1st December. We hope you'll join us at Deepdale Christmas Market for Christmas presents, decorations, plenty of festive cheer, tasty food & drink, and there will be entertainment throughout the weekend! You can combine your visit to Deepdale Christmas Market with time to enjoy the North Norfolk Coast during one of its most beautiful seasons - Beach walks, wildlife spectacles, big skies. Mark the 29th, 30th November and 1st December in your diary and we’ll see you in Burnham Deepdale for the start of the festive season. Car Parking is FREE at Deepdale Christmas Market. We open up our farm yard and a couple of grass fields for car parking. We have a one way system this year, which we hope will reduce congestion, please follow the signs and our parking team will show you where to go. Please don't park where there are no waiting cones, to help with traffic management. Well behaved dogs on short leads are welcome. Please note that the event can become crowded at busy times, so dogs may not enjoy the experience. Is Cash available at the market? Unfortunately some lovely individuals borrowed the cash point on a permanent basis and so there isn't cash available. Please bring what you need, and most of the stalls will accept credit cards. Do stalls accept Credit Cards? We've upgraded our broadband service and so most stalls have the option of accepting credit cards. Are there places to eat at Deepdale Christmas Market? We have more than 10 food outlets including Deepdale Cafe, street food, hot drinks and charity cafes so you have plenty of choice. Is there Disabled Access at the market? We have an area closer to the market for blue badge holders to park. Please note that the site is quite spread out and it is a temporary event so some of the marquees stand on gravel. 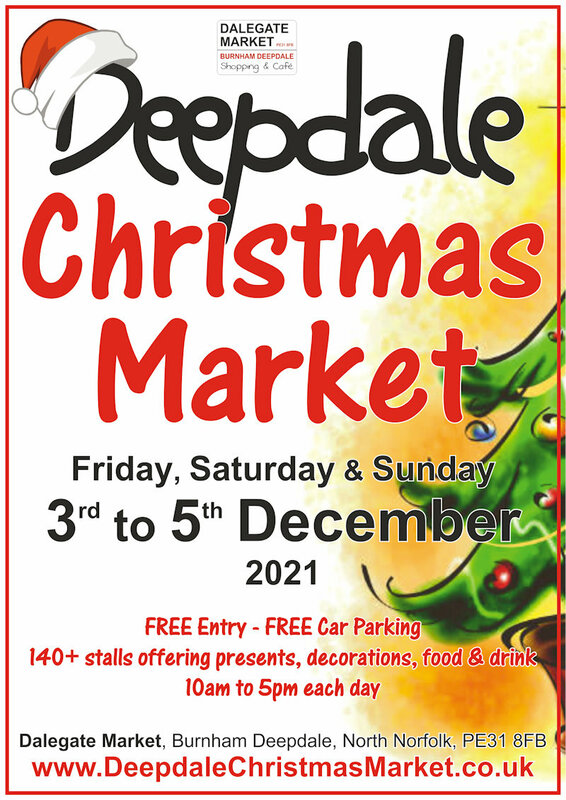 Deepdale Christmas Market is open from 10am to 5pm on Friday 30th November, Saturday 1st and Sunday 2nd December. Are there particularly Busy Times? Traditionally Saturday lunchtime has been the busiest time of the market.